New exclusive limited collection! 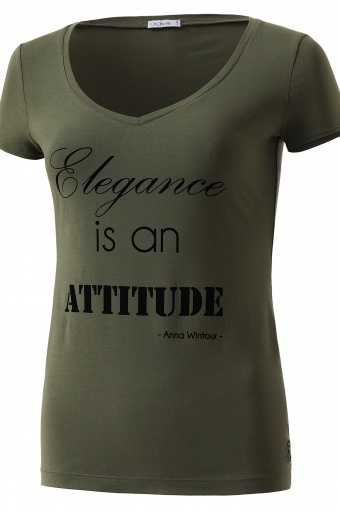 'Elegance is an attitude' T-shirt by OKE by me. With this army green shirt with Anna Wintour quote you don't have to choose between elegant and tough. It's the best of both!! Very fashionable t-shirt with Elegance is an attitude-print in black. This t-shirt is a real fashion-catch and can be worn in lots of ways. The V-neck and cute capsleeves are utterly flattering and the shirt accentuates your body very subtle. The black toned print contrasts really nice with the khaki green colour of the shirt. The embroidered logo in black leaves a luxurious finishing touch.